Consumer-driven health plans (CDHPs) - high-deductible health plans (HDHPs) often paired with health savings accounts (HSAs) or health reimbursement accounts (HRAs) - are not achieving long-term savings greater than what would be reached by raising the deductible on traditional PPOs, according to the 2012 UBA Health Plan Survey, the largest independent benchmarking survey in the industry. Although nearly 60 percent of the 11,711 employers surveyed said they plan to offer a CDHP in the next five years, despite some regional variances, PPOs remain the dominant plan type with 61.7 percent of U.S. employee enrollment and currently return a lower average cost per employee than CDHPs at nearly every deductible range. Click here to see a chart illustrating this trend. The greatest savings of a PPO over a CDHP was achieved with a deductible of $2,000-$2,999, where PPO cost per employee was $7,811 and CDHP was $8,859, a savings of $1,000 per employee. In a small business with 50 employees, that is a savings of $50,000 annually, or more than $4,000 per month. The key to savings, UBA's survey finds, is placing an up-front hurdle, a deductible greater than $1,000, on any plan type, in order to positively impact consumer behavior, lower consumption and decrease cost. Despite the high deductibles in CDHPs, employers have mistakenly removed the employee risk by funding either an HRA or HSA, which does not force lower consumption. Studies show that 80 percent of all employees will not have more than $700 in annual health care costs, so by funding the first $1,000 of an insurance plan, most employees will never see the cost of their health care, and therefore, not make better decisions. "Employers are turning to CDHPs as a cost-cutting solution against the relentless upward spiral of health care costs," says Thom Mangan, UBA CEO. "However, our research shows that small-to midsize businesses in particular, who may be considering these plans may first want to consider increasing the deductible on the plans they already have to achieve the same initial savings. Or, prior to implementing a CDHP plan, employers should build a culture of health and wellness in their workplace that drives employee behavior towards quality, low cost medical care and prescription drugs." UBA's survey, which is nearly five times larger than the next largest health plan benchmarking survey, shows that CDHP cost savings appear to be overestimated at the national level as does their popularity, a finding diametric to what is often reported. The UBA study found that savings created by CDHPs over the plans they were replacing or HSA, averaged 1.75 percent in 2012, a significant reduction from prior years. Enrollment also decreased to 15.6 percent (a 1.8 percent decrease from 2011), and nationwide enrollment among employers with 1,000 or more employees dropped substantially from 15.9 percent in 2011 to 11.3 percent in 2012. The area of the country that has seen the biggest increase in CDHP growth is Minnesota, which saw the percent of employees enrolled in CDHPs increase from 15.5 percent in 2010 to 37.1 percent in 2012, a rate 18.4 percent higher than the national average in those same years. Other areas with rapid CDHP growth include Indiana, Virginia and the Northeast region. The only western state to see CDHP popularity increase was Oregon, where percent of employees enrolled in CDHPs increased from 12 percent in 2010 to 20.3 percent in 2012. Overall, CDHP enrollment in the west is the lowest in the country with only 7.7 percent of employees covered, a slight increase from 7 percent in 2011 and 4.6 percent in 2010. HMOs account for 31.3 percent of the market in the west. 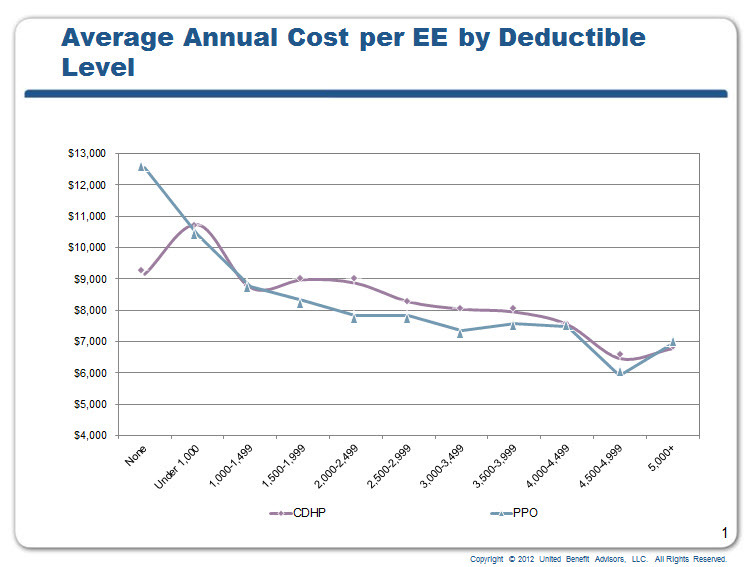 "Health care reform is likely to spur the growth of high-deductible consumer-directed health plans," says Mangan. "As medical cost information becomes more transparent, and as patients become better consumers, employers have a chance at cost containment. But how they choose to design their health plans should be based on benchmarking data and workplace culture. With careful plan design, employers could see only 5 percent annual health cost inflation instead of the 10 percent anticipated in the coming years." Data in the 2012 UBA Health Plan Survey are based on responses from 11,711 employers sponsoring 17,905 health plans nationwide. Results support employers of all sizes with data by region, industry and employer size. The survey's focus is intended to provide a current snapshot of the nation's employers rather than covered employees. Results are applicable to the small to midsize companies that comprise approximately 98 percent of the nation's 5 million-plus employers, as well as to larger employers, providing benchmarking data on a more detailed level than any other survey. To request a free copy of the 2012 UBA Health Plan Survey Executive Summary, visit www.ubabenefits.com, or contact a UBA Partner Firm for a customized benchmark survey based on industry, region and business size. Join UBA CEO Thom Mangan as he walks through the benchmarking data in a recent webinar.